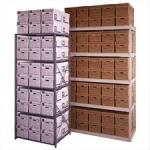 Archival box storage and storage shelving by Borroughs is a must for any shelving need. Borroughs has built its business by manufacturing products of high quality and value. The list of quality products produced by Borroughs includes industrial storage equipment, office storage equipment, library shelving and grocery store checkout systems. But Borroughs is more than just the manufacturer of products. Over the past 50 years, we’ve earned a reputation for outstanding service and responsive on-time delivery that we continue to work hard to maintain. 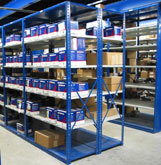 Borroughs offers a wide range of shelving solutions proven to cost less and last longer than other systems. 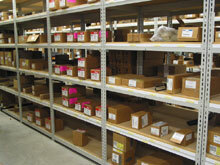 Products offered by Borroughs are Box Edge Plus, Rivet-Span, Inactive Records Storage, Storage Cabinets. 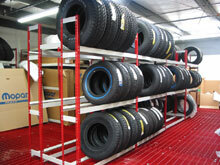 Borroughs also offers High Density Mobile Shelving as well as Retail / Checkout Systems and Shop Furniture. Multi-tier systems are also available from Borroughs. Borroughs storage systems can be used in a variety of applications such as retail display, medical records and x-ray storage, retail backroom storage, distribution centers, auto parts storage, mobile work stations in a repair shop, and workstations in a distribution center. These are only a few examples of applications that can be used with Borroughs storage products.